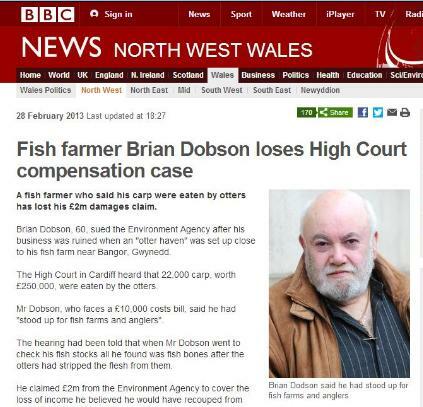 Carp famer and fishery boss Brian Dodson says he will go bankrupt after his attempt to sue the Environment Agency failed. Mr Dobson (60) claimed £2 million in compensation after he claimed otters killed his stock of 22,000 carp. He argued that the EA had a duty of care to alert him to the clear up work it was doing on the River Cegin, less than a mile from his Waen Wen Fishery in North Wales. Otters took up home following the work. The High Court judge decided the EA had no case to answer and ordered him to pay £10,000 in costs.